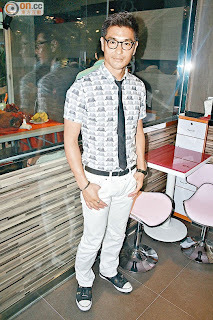 Yesterday Ruco Chan appeared at the grand opening of a dessert shop. He expressed the owner is a friend he "played with since childhood". The reason is because when he first debuted in the film industry, the owner was the first person who signed him, so he must be there to support him. Ruco was asked if he wants to be a boss of his own store too? He said: "I do have plans. Many friends have asked me to partner with them, but I want to concentrate on filming series. I don't want to be distracted." Ruco expressed if he does start his own business, he hopes to open an eye glass shop: "I want to be in the eye glass industry. Since childhood, I have always loved glasses, I feel people wearing glasses really have good taste and self-procession."